First off, the International Space Station put on a good show for Cape May-area birders and other residents and visitors shortly after sunset last night, making a relatively high-above-the-horizon, four-minute crossing of Cape May air space; I was joined by the La Puma family; friends of theirs from Miami, FL; and Scott Whittle (sans Monkey) on the Hawkwatch platform to watch the spectacle. For those interested in viewing this amazing technological wonder, the ISS overflight schedule can be consulted for your particular area. 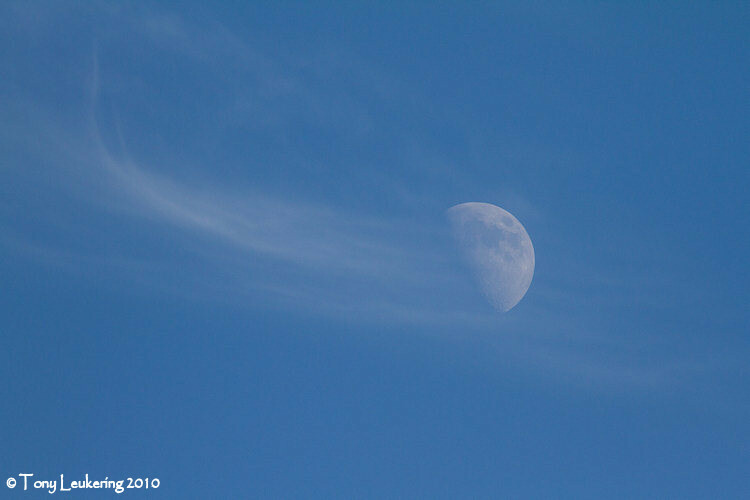 Secondly, if you enjoy looking at the moon, better take a good ogle soon, as the high-level winds today were scouring the moon, eroding it off into the sky! One can see from the above picture that it's already half gone! Finally, I thought a bit of Cooter info would be of interest. The above bird is Cooter, the coot-eating Great Black-backed Gull about whom/which various of your Bird Cape May bloggers have written. While it's foraging habits have been oft-discussed, I wish to point out how to identify him/her away from coot carcasses. Note Cooter's very ragged secondaries (the inner wing feathers on the trailing edge of the wing). Also note the pink arrow, which is pointing to the tip of the currently-growing-but-still-very-short 9th primary (p9). 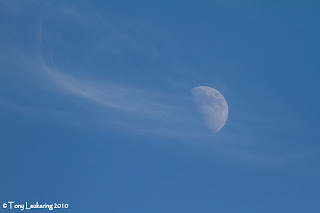 It will grow to be longer than the next primary inward, so it's got a ways to go. Also note that the outermost primary (p10) is not at all in evidence as yet (the picture was taken today), so the old feather has only recently been dropped and the new feather has not yet emerged from behind the primary coverts. As with most species of birds that molt all of their flight feathers in a given year (in a single pre-basic molt), once an individual Great Black-backed Gull nears completion of its primary molt, it instigates molt of its secondaries. We can count inward from p9 (p8, p7... through p1) to see on both wings that the outer few secondaries have been replaced (clean, unworn white tips). We can also see that the remainder of the secondaries on the bird's right wing are trashed (I guarantee that those on the left are nearly identical) -- much more so than is typical for an adult gull. One might surmise that upside-down and kicking American Coots might create that sort of damage, but that would be sheer speculation. Not bad speculation, but speculation none-the-less. 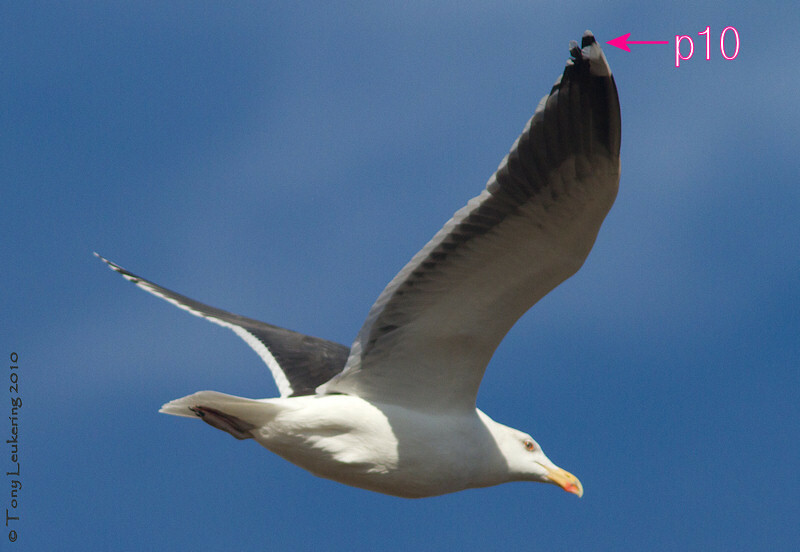 Below, find a picture of another adult Great Black-backed Gull that, like Cooter, flew over the Hawkwatch platform today. 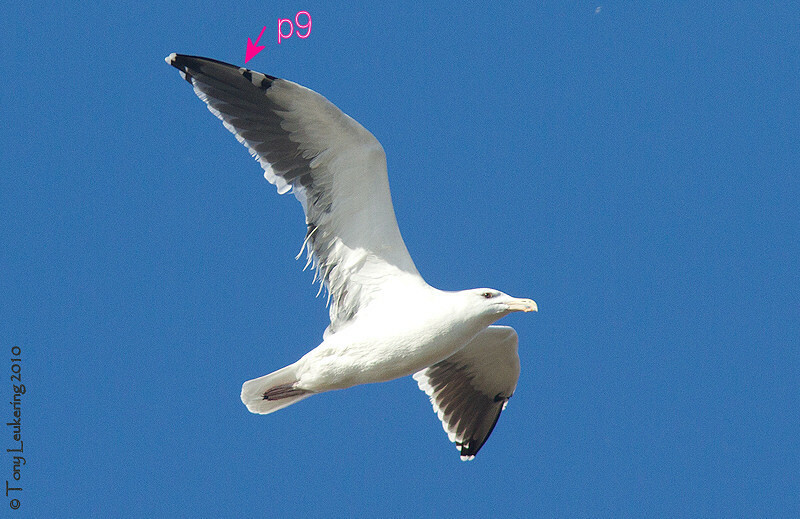 This bird has nearly completed its entire flight-feather molt (and, by extension, it's entire pre-basic molt), with p10 being nearly full-grown; the pink arrow points to the very terminus of the extensive white tip to that feather -- the feather has very little growing left to do. The point of all this, is that Cooter's state of flight-feather molt and its trashed secondaries enable her/him to be identified away from its coot-hunting grounds on Lighthouse Pond. In fact, Cooter is seen most days flying from Lighthouse Pond southeast past the platform to either hang out on the dock on the south side of Bunker Pond and/or bathe in Bunker Pond. Of course, once Cooter finishes the replacement of those ragged secondaries, she/he will once again become difficult to pick out of the pack by plumage, though, perhaps, its habits and schedule will remain consistent.